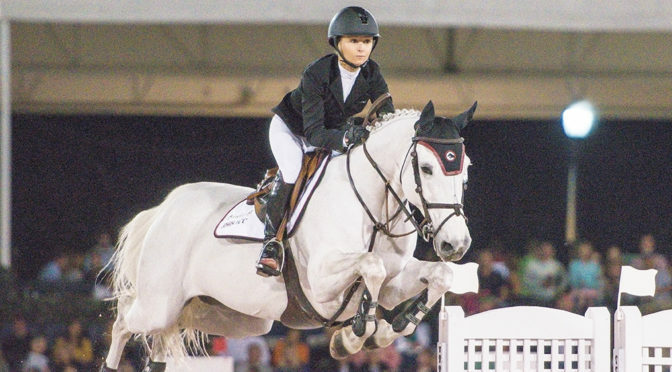 Georgina Bloomberg is both a top equestrian and a philanthropist, putting her well-known name to work protecting animals and aiding equestrians in need. Daughter of Michael Bloomberg, she began riding at age six. She won the 2001 USET Talent Derby, won team gold at the North American Young Rider’s Championships in 2002 and individually in 2003, won the USET Maxine Beard Award in 2004 and made her debut at the FEI World Cup Final in 2005. In 2009, Bloomberg won the eighth round of the WEF Challenge Cup and won round one of the WEF Challenge Cup Series in 2010 before winning the Bluegrass Festival Grand Prix and placing top in 2012 and 2013 throughout Europe and America. More international success followed. She helped the U.S. claim the team bronze at the 2015 Pan American Games. After spending 2018 rebuilding her string of horses, she headed into 2019 with a barn full of talent. After top placings with Chameur 137 in fall World Cup qualifying classes, she’s sixth in the Longines FEI Jumping World Cup Standings – North American Eastern Sub-League and aiming for the 2019 Longines FEI Jumping World Cup Final in Gothenburg, Sweden.